A 15-year old kid with his two parents. His mother doting over him, his father off to work each day. This was my grandfather and his parents in 1940. Charles James Lowry was a sophomore at Ursuline High School when Census Bureau employee Helen G Fouistell knocked on the door of 207 Thornton Avenue, on Youngstown’s North Side. Carrying her oversized clipboard and a new Census sheet, she found my great grandmother Margaret home on Friday, April 5, 1940. My great grandfather Charles Edward was probably off at work, a analyst at Republic Steel. Steel still put bread on the table in Youngstown in 1940. Five of the 19 employed individuals that Helen interviewed for this census sheet worked in steel mills. Lowry, Charles E, head, male, white, 39 years old, married. Has not attended school since March 1, 1939. Attended school through 12th grade. Born in Ohio. On April 1, 1935 lived in same place. Was at work for pay the week of March 24-30, 1940. Works 40 hours a week as an analyst in a steel mill. Worked 52 weeks in 1939. Earned $2,000 wages in 1939, with no wages from another source. ” Margaret M., wife, female, white, age 37, married. Has not attended school since March 1, 1939. Attended school through 12th grade. Born in Pennsylvania. On April 1, 1935 lived in same place (not a farm). Did not work or seek work for pay. Engaged in housework with no income from another source. ” , Charles J., son, male, white, age 15, single. Born in Ohio. On April 1, 1935 lived in same place. Has attended school since March 1, 1939. Completed school through H-1 (high school, 1 years). Has no income from a job. 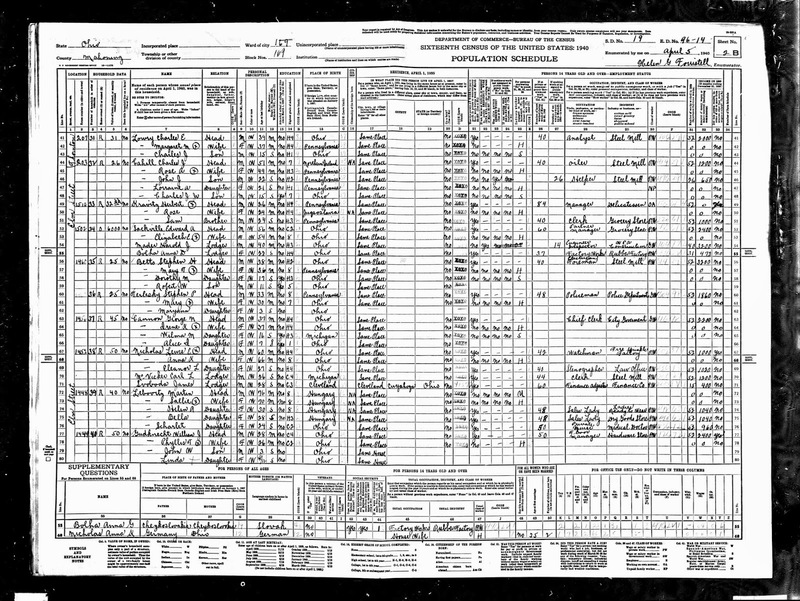 1940 U.S. Federal Census, Mahoning County, Youngstown, population schedule, Enumeration District 96-14, Sheet 2B, Dwelling 31,. Charles E Lowry; digital image, Ancestry.com (http://www.ancestry.com : accessed 20 October 2013), citing National Archives microfilm publication Roll T627_3267. ← Wordless Wednesday – Happy Birthday Grama!